Posted by matt on April 21, 2018 at 10:20 am. You see a lump in the driveway, and as you get closer, it resolves into a fox. 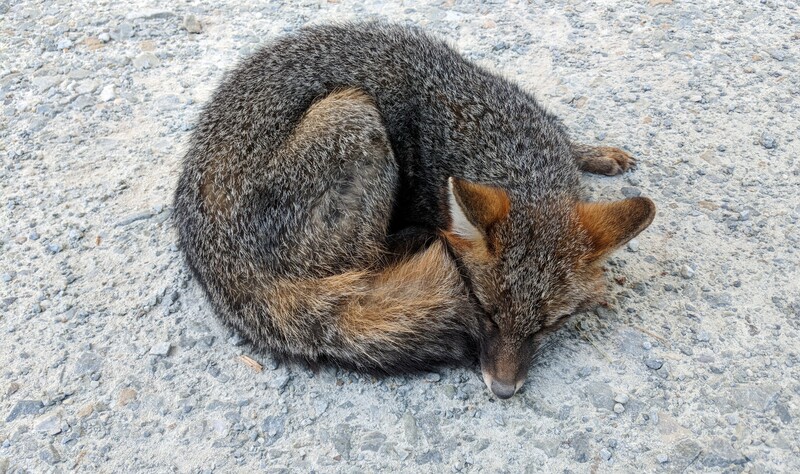 A fox that is laying down in broad daylight. It is chewing on its own forelimb, now some rocks. Flecks of spittle are on its lips. It looks through you as you approach, its eyes half-closed, teary and mucus-filled. It moves in a way that is slow and jerky, and it does not attempt to get up. The urge to look closely is nearly overpowering, but you know that this animal is very sick, dying, and must not be touched. It could hurt you, though not because it wants to. You already know what you will do, but you methodically run through other possibilities to see if perhaps this responsibility can be avoided. But in the end, the choice is simple. Ease his passage or leave him. Do it, or run away. Take some of his pain and make it yours, or leave him to experience the full measure. This will be the third time you’ve done this. The rabid raccoon, the injured pregnant deer, and this fox. So you get back in your vehicle, go home, and “get out the .22”. So weird to be doing this. You used to live in a city. Get a shovel. Drive back. Maybe he won’t be there. You see a lump in the driveway. You park, load the rifle, check that the safety is on, and slowly approach the fox. It is looking at the sky. It does not appear to notice you at all now. You are close enough, and you have begun to focus, and you hear its breathing. It is coughing, labored, wrong. It is so unbelievably beautiful. It seems to hear you, and its breathing slows. It stops gnawing at the air and it slowly arranges itself into a picture-perfect sleeping pose as you continue talking. It is hard to believe that this creature can exist in such perfection, free of you until this moment. The energy of the sun, harvested and rearranged and temporarily fox-shaped. Your mind struggles to comprehend how perfect it is. It closes its eyes most of the way. The wind is in the trees and you flip the safety off. You pull the trigger, and although you know there must have been a gunshot, it doesn’t seem to rise above the sound of the trees swaying in the wind. You flip the safety back on and walk back to the truck and get the shovel to move it into the woods. 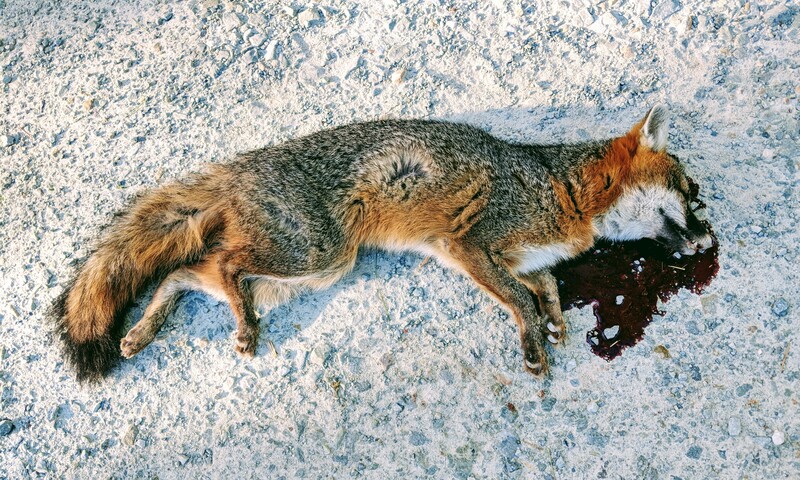 The fox has relaxed on to its side, its eyes still closed, blood soaking into the gravel around its head. Everything is so vivid. Everything is loud. You feel full and hollow at the same time. You take a picture. Somehow, it looks exactly like it was.